For this season's blog hop (follow the links to discover other blogs from around the world), our wrangler decided to go with a non-seasonal topic. What, he asked, has helped us make a quantum leap in our readings? 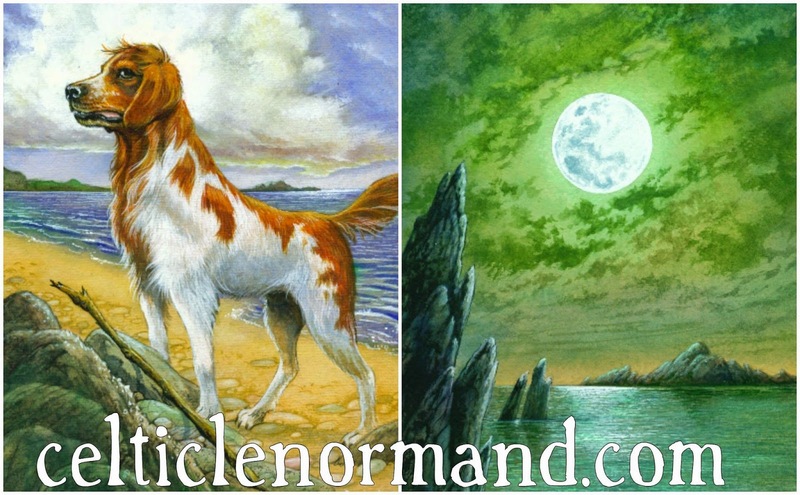 In terms of Lenormand readings, my answer is clear: creating the Celtic Lenormand! In Mary K. Greer's book 21 Ways To Read A Tarot Card (Llewellyn, 2006), she suggests drawing cards, even if simply reproducing RWS imagery in sketch form, as a way to explore a card and its meanings. While I did that with my Kindergarten Lenormand (2nd Edition, 2014), it was the actual designing, without drawing, of the Celtic Lenormand that made the biggest difference to me as a reader. In the process, I really thought about how I read each image: which keywords I associate with each card; and how those keywords relate to the animal, object or person involved. For instance, I connect the Dog with friendship and reliability. By putting a stick at his feet, ready to play fetch, I subtly pointed towards those two aspects: you play with a friend, and a dog can be relied on to fetch a stick when thrown. Or consider the Moon: two keywords for it are emotion and reputation. Placing the Moon above dark waters suggests the aspect of emotion, while the Moon's reflection in the water hints at the idea of how we are seen by others, through their emotional perspective. Of course, the Moon only shines because it reflects the sun's light, but that is an extra layer that remains implicit. While in reading Lenormand cards, these kinds of visual cues are not important, as the cards act more like pictographs pointing to keywords, I still felt it would be handy to have clues towards those keywords subtly in the images. Also, in Lenormand readings the biggest factor is how the cards combine. Even so, connecting with each card more profoundly makes such connections easier, too. When Dog and Moon combine, for instance, we might have an emotional friend, be aware of a friend's reputation, or see a need for emotional reliability. And when Moon and Dog combine, we may be able to rely on our reputation, have a reputation for friendliness, or be loyal in our emotions. Great post! You make reading Lenormand seem so easy! I actually think it's clever the way you gently suggest key words in the images, and while they are more "full" than traditional Lenormand, they're still simple enough to be clear in what they represent. And I love Will Worthington's art ;) Can't wait for this to be released! With your creative perspective, I can imagine you designing something incredible, Karen! I can't wait for this deck to come out, Chloe! Me neither, Ali :) Doing readings with my home-printed prototype has been good, but not the same as that lovely, smooth, proper card feeling! Yes, I like a literal take on cards some days and on others not. I tend to visually read Lenormands or compare the same card across decks. It's all good, whatever comes up. Funny, I was just doing daily draws with the Lenormand deck I created for myself (The Illustrative Lenormand) and I found as you did, that writing about it and tuning it to what was included in the image, and including subtle clues in the image went a long way toward my understanding of keywords and concepts. It made the deck more meaningful, not just a collection of various pictographs. I hadn't realised the Illustrative Lenormand was yours, JJ. Is it available for purchase anywhere (I'm a sucker for self-published decks)? I especially loved what you wrote about the Cross, that is very much how I see it, too! It is not available for purchase Chloe. I made myself a copy and one for Steve, otherwise it remains as Photoshop files. 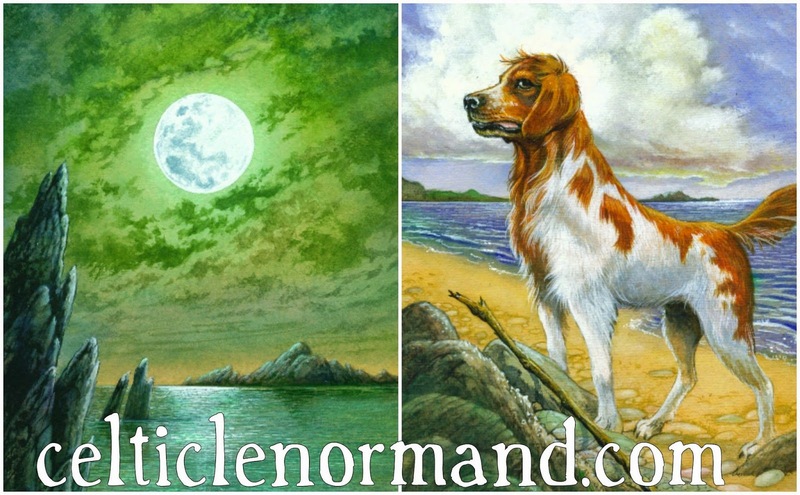 Understanding that the Celtic Lenormand ends up stretching the Lennie reading theory a bit to stay true to the theme, I think you and Will have done a great job of keeping the main image clear and then hinting at the keyword elements in the visuals. Definitely looking forward to adding this particular deck to my little collection. Well, now you've got Caitlín's book, you've no excuse not to become an expert in short order :) And I hope you will go for this deck, too, having seen all the images at the Conference!